Record Collecting for Girls [Book Review] – my books. my life. Music lovers. I have a new book for you. Have you ever noticed that most books about music (and magazines about music) are written by men? Well Courtney E. Smith did. I hadn’t given it much thought but she is right. Women make up an even amount of music listeners, so shouldn’t we also write about music? Enter Record Collecting for Girls. Record Collecting for Girls explores how women relate to music. There is a chapter about Top Fives (remember High Fidelity? ), guilty pleasures (mine is the Glee soundtracks), “our” songs, and the classic Beatles vs. Stones debate. She explains why loving The Smiths too much is a dealbreaker for her in men and questions why there are so few girl bands. Each chapter ends with a playlist. Which will be helpful the next time you are in need of some making out or breaking up music. And there are entertaining Interludes along the way (one such Interlude has made be give last.fm another try). Because this is a book about music, it’s understandably very personal to the author. Some people may not like this (because their musical tastes are very different or they may even suffer from the dealbreaking Smiths Syndrome), but I think it would be impossible to avoid. Smith is five years older than me (as determined by where she was in life when Romeo + Juliet was released). This could be decades in music years, so while I relate to many of the artists she discusses (we share a love for The Shins), some of them I’ve never really experienced. This doesn’t ruin the book at all for me. I can still relate to the feelings behind it (although she did almost lose me by saying she cannot stand Arcade Fire and I actually DO think The National are genius). If you are a music fan, man or woman, I think you will enjoy this book. It’s lighthearted, funny, and makes you look into your music habits. Plus, I have about a hundred new tracks to go listen to now and there aren’t many things in life that make me happier than new music. Extra: Follow Courtney E. Smith on Twitter. [P.S. : I love that we live in an age where I can finish a book and then chat with the author 10 minutes later]. *Page numbers reference the e-galley and may differ in the published book. Heh, you just wrote the review I was going to write. Guess I had better try to be original. I have a strange relationship to books about music because if the author starts naming too many bands that I am unfamiliar with, I start to feel a bit disconnected. I wonder how I would relate to this book, and might have to give it a look the next time I am at the book store. I certainly did like what you had to say about it! You know I’m a big music fan, so I will be checking this one out! OMG I have to read this. It doesn’t really bother me if she mentions I don’t know. I’m always excited to dive into something new. Awesome find! I NEED to read this book. Not just read it, but buy it. It’s been way too long since I’ve read a music-based book. Thanks for the heads up on this one! OH SNAP. I’m all over this one. This sounds like something I would LOVE LOVE LOVE. Did you ever read Love Is A Mix Tape? Another great music related book. I have his other book Talking to Girls About Duran Duran but haven’t gotten to it yet! I’ve never been a lover of music books, but this sounds so great! Thanks for turning me onto a book I may otherwise have skipped. This sounds really good! I would have passed it over just looking at it as a YA novel. Thanks for reviewing it! I’m excited to read this – thanks for the review! 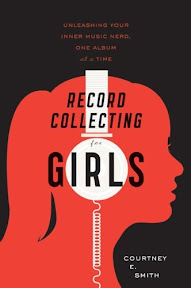 Pingback: Record Collecting for Girls by Courtney E. Smith (Thoughts) « alita.reads.